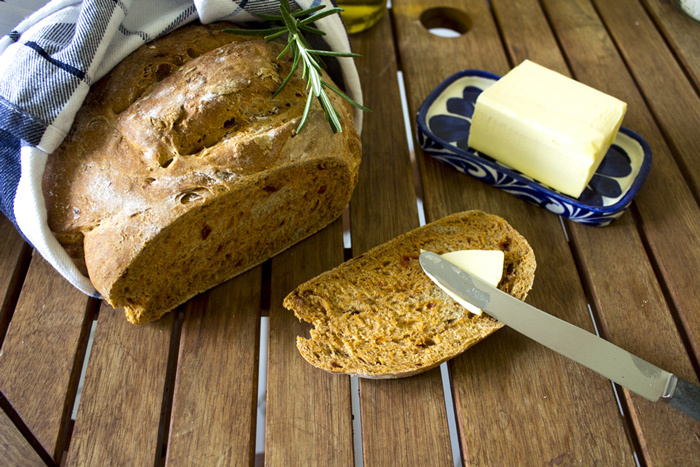 Dried tomatoes bread recipe - French girl "cusine"
Why am I beginning to bake my own bread? That’s definitely a long story… After leaving my home country, France, I was not expecting to find better bread in Switzerland. But when I arrived in Zurich, we found with my boyfriend the best bakery ever in Universitätstrasse. They are baking delicious bread called the “St Galler” and also “baguette” with dried red pepper. They have wonderful “croissant” as well. They just miss the “pain au chocolat”. That’s all! I just moved back to Lausanne few months ago and I still didn’t find any good bakery. They are all using premade bread such as “pain paillasse” and even if I can understand that it is really convenient, it is definitely not always really tasty. So that’s why I am beginning to bake my own bread. This dried tomatoes bread was amazing said my boyfriend. I hope you will like it too. If you do not have a robot, make a well in the center of the flour. Pour the ingredients into it and knead by hand until you get homogeneous dough. If you do have a robot, this will be easier for you. Place all the ingredients into the bowl and knead during 4 minutes. Let sit the dough during 2 hours. Brush the surface of the dough with water and let it sit again 30 minutes. Preheat your oven to 240°C (470°F). Put your bread at the bottom of the oven on a baking tray and add next to it a dish full of water. Bake for 12 minutes and without opening your oven low down the heat at 180°C (350°F). Bake again 30 minutes and voilà! Having good bread every day is absolutely mandatory – looks like you´ve made your way out of the “bread-gap” with this delicious looking loaf! Thank you. I hope that I will find a good backery next to my place! Less work! BEautiful! 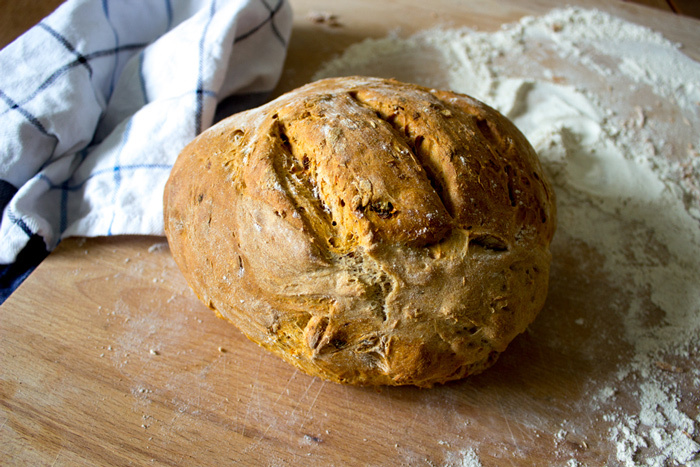 There’s nothing quite like home-baked bread, even if it’s plain. Yours is gorgeous!